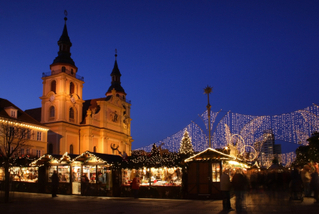 A German style Christmas market has come to town. I haven't been yet, but all sorts of stalls, fairground rides, and ice-rinks have gone up in Hyde Park. And for once, it's suddenly cold and frosty here in London. 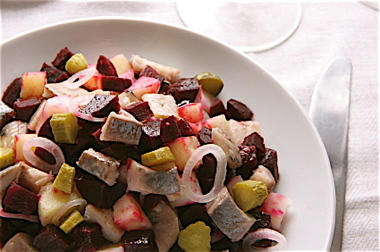 Every Christmas I make a German or Scandanavian style Herring Salad. I was given the recipe by my great uncle whose family originally came from Cologne. He treated the enterprise as a work of art, and "built" up the salad over three or four days; however I recently ran into a Swedish girl at a cocktail party who insisted that it needed to be made quickly- and then finished off immediately. I'm going to go with my great-uncle on this one, as the vinegars in the salad should act as a preservative. This is how I do it: You will need a large mixing bowl. Chop up some herring. You are supposed to use salted herring, but I use Scottish roll-mops- which are herring marinated in vinegar and spices. Add some diced cooked potatoes, peeled diced apples, diced gherkin, chopped celery, chopped anchovies, and ham- chopped up into small pieces. Mix it all around. Throw in a handful of capers, and some diced cooked beetroot. The beetroot will make the salad go an interesting bright pink colour. Next, mix up a vinaigrette. That's just a small dollop of mustard mixed with sugar, and wine vinegar to form an emulsion, with oil added slowly. I suggest you use a light oil, such as sunflower oil, rather than olive oil for this one. Olive oil is too Mediterranean in style and flavour. Finish off the salad with lots of chopped dill, and chopped egg white. It's delicious.